Hunkered down in the dead of winter, slammed with projects and deadlines. Working not 9 to 5 like most folks but more like 24/7. Needing a break called me mate, so much to catch up on. 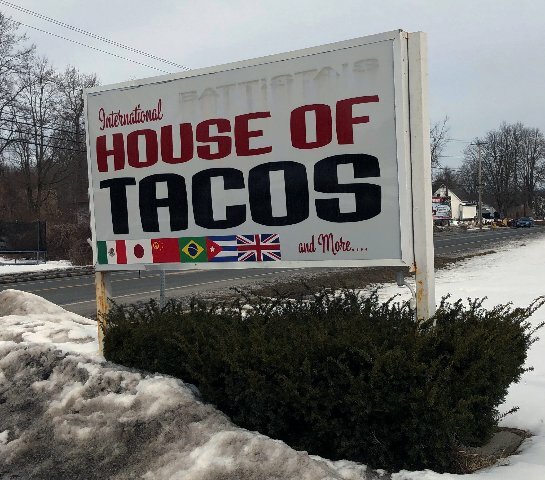 Robert suggested the new taco joint down the line from Pittsfield. Just shy of Shaker Village, on the left, lamming out of town. You can’t miss it. A familiar destination has gone through iterations. Best remembered for Asian fusion, Astrid loved their Vietnamese crepes. Now long gone. 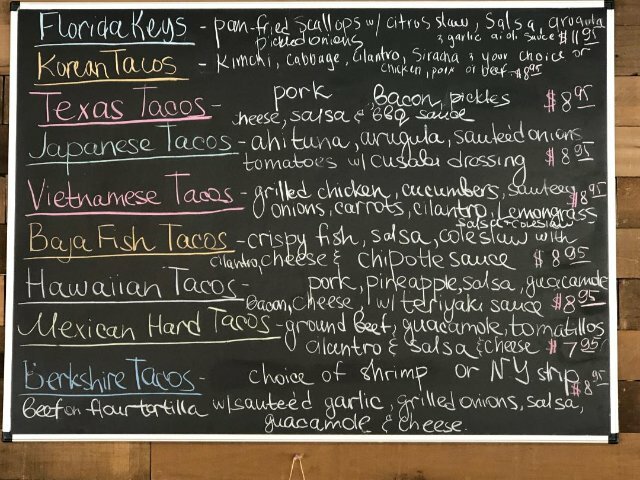 The latest overhaul is International House of Tacos and More a casual, fun idea for a cozy lunch. Being February the entrance was treacherous with ice. We made our way cautiously. Once inside it all came back in a flash. That L shaped space around the bar and wood paneled walls for a rustic road house look. Although relatively new, on a Saturday afternoon we were lucky to find a table. 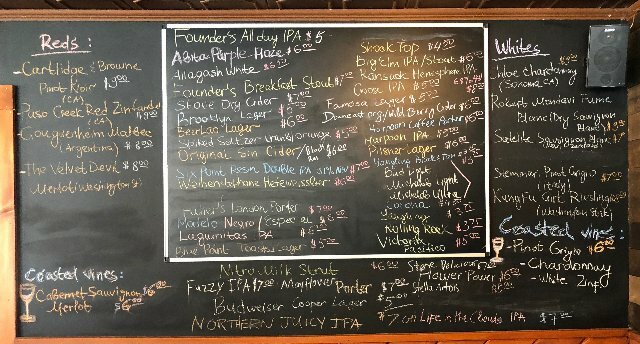 Seems word is out about cheap eats and lots of craft beers. 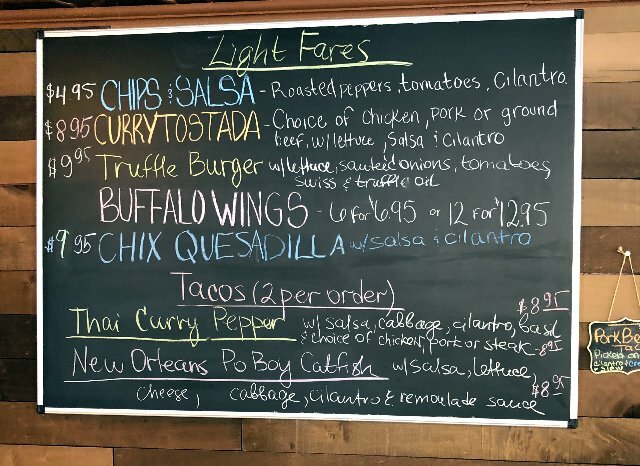 The menu, scrawled on several blackboards is fairly basic. 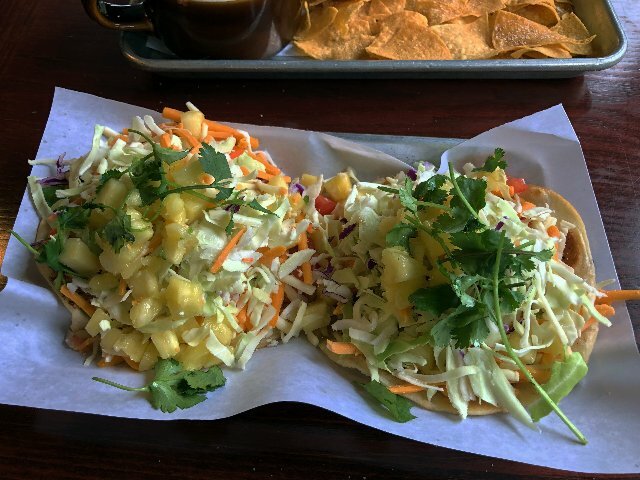 There are numerous variations of tacos with international concoctions. 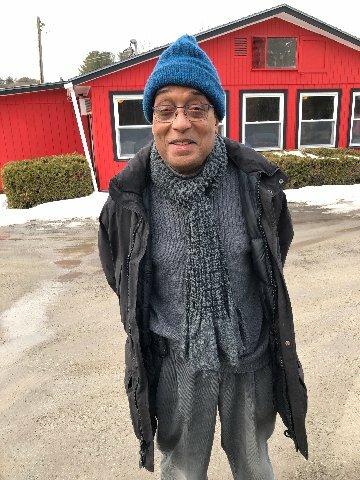 He went for Vietnamese while I ordered Jamaican. 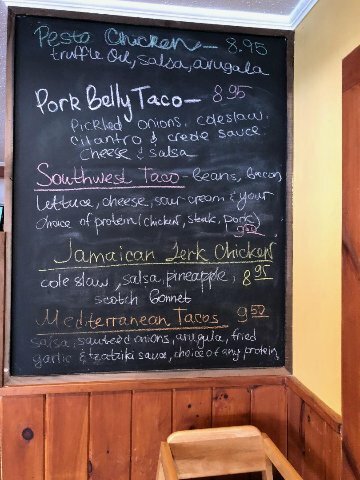 Mine featured jerk chicken, pineapple, slaw, and watch out, Scotch Bonnet pepper. Soaking up the funky ambiance we hunkered down and caught up about friends, family, Trump, and state of the universe. 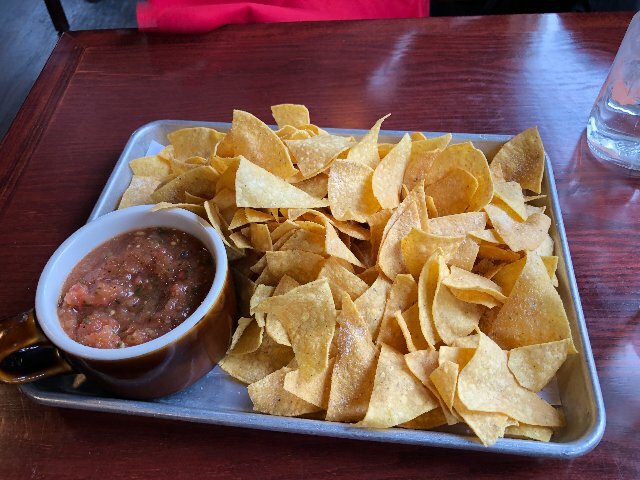 To get started we ordered chips and salsa. That was the first mistake. At a taco joint you expect them to come with a meal. The first round, traditionally, is comped and you pay for a refill. Or order nachos which is a whole other matter. 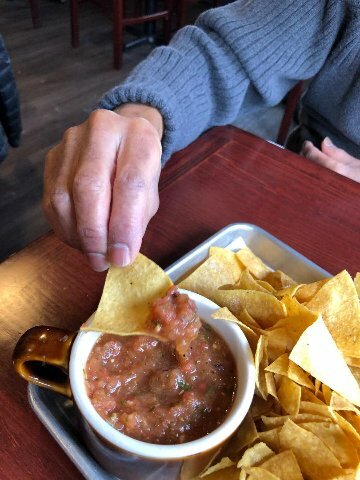 The salsa was good but not great. It could have been fresher with more heat and cilantro. But the chips, while fresh and crispy, were a problem. They came obscenely salted. 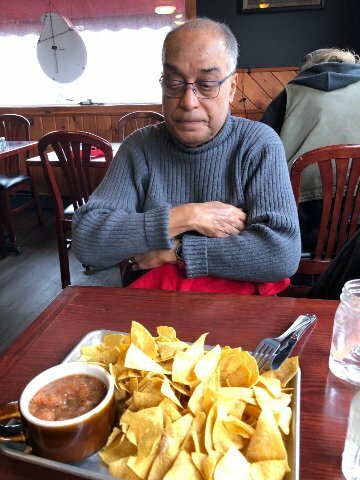 I don’t recall ever being served salted chips. Being a couple of geezsers we are both on low sodium diets. We asked the friendly waitress if it is possible to have unsalted chips? Politely, she said that there is a fresh batch each day and they come salted. But she offered to pass the information on to the chef. 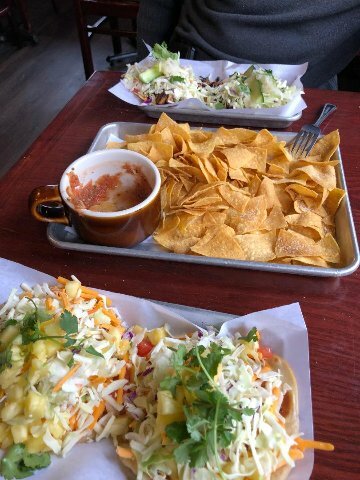 The tacos came as a surprise. Orders at $8.95 come as a pair. The ingredients were piled so high that we asked her about the protocol for consuming them? Does one use a fork or just slop into them trying to pick it up awkwardly? The compromise was to peck at it with a fork and, when reduced, pick up what’s left as best one can. That meant a layered experience rather then getting the whole enchilada, so to speak, with one bite. In my case it entailed working through mostly slaw and pineapple bits before getting to the meat. I feared the heat but it never happened and the impact of jerk chicken was underwhelming. It was surprising not to see salsa and sauces on the table. I was craving some spice that oddly was lacking. This was, after all, the Jamaican recipe and that implies a ton of flavor. Overall, there was a good balance of quality and price. It’s no wonder that there is a growing local clientele. It’s a good joint to knock back a few brewskies and nosh. 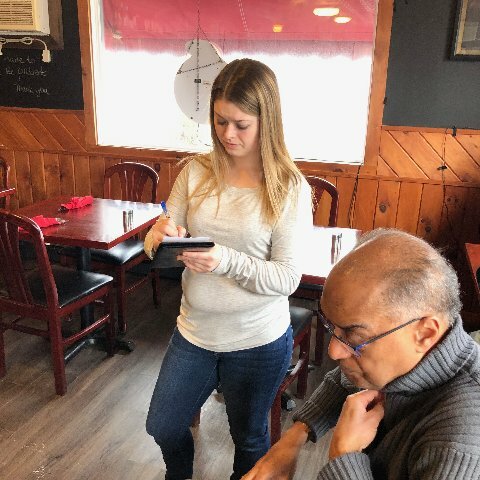 It’s a welcome addition to affordable dining options in and around Pittsfield. Hopefully they will clean up their act a bit. Making our way to the car Robert was surprised at the guns. With a bit of shock I realized that, while the same maroon color, we had gotten into the wrong car. Sorry about that mate. Fortunately, nothing came of the mistake. No good comes from messing with blokes packing heaters. Guess it was just another senior moment. The agenda of the afternoon was a wine tasting at Spirited in Lenox. 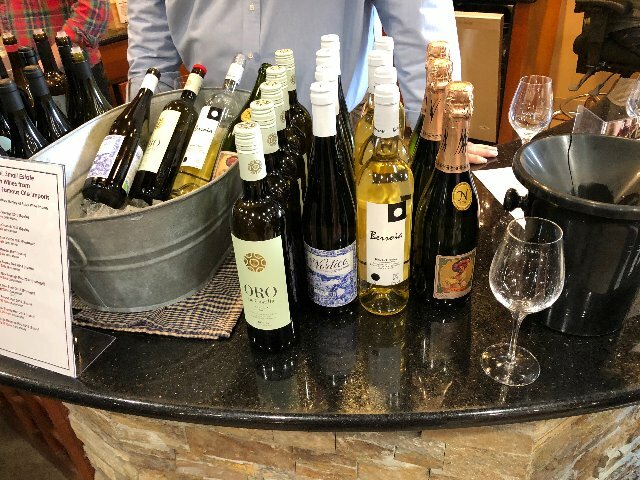 The featured wines were from Spain and Portugal. The cava was ok but the reds were mostly overwhelming and I poured them into the spit bucket. I purchased a case of 2017 Nortico Alvarinho. It was my favorite white of a week of tasting in Portugal on a press tour last year. It was ‘on sale’ at $12.95 a bottle. Checking on line several retail outlets had it for $10.95. So it wasn’t a super saving. But it proved yet again that good, drinkable, Portuguese wine is undervalued. The on line rating averaged 88 for this product. I like the wine for its fruity, light and refreshing delivery. After a long winter it was time to restock with every day and fine wines. Recently, I got a couple of cases of Chateau de Paraza from the Minervois region of France. West Liquors in North Adams gets it for me from time-to-time. I had already run through two cases from December. With discount its just under $10 a bottle. For price and quality it’s, to me, the best everyday red out there. The trick is to have affordable day-to-day wines and some high end ones aging in the rack for intimate dinner parties. When you crack a fine bottle the difference is palpable and great fun to share the moment. Now and then, when tangled up and blue, I indulge in a better wine. But I would be too riddled with guilt not to share the rare top shelf. From Spirited, with some advice from a helpful storm manager, I got the monthly-special, mixed case for $100. It entailed six whites, and three each of Argentine malbec and cote du rhone. While tempting I resisted springing for high end Châteauneuf-du-Pape “on sale.” They say 2016 is a great year. I have a case stashed that I don’t even want to think about. Unlike me and me mate its still way too young. Yikes!